Your organization’s digital investments need to reflect its vision. Your organization’s vision forms the guiding light for developing the right investment strategy for digital transformation. 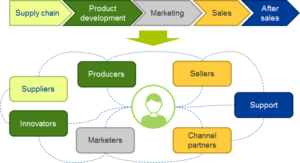 The linear value chain is shifting toward ecosystem-based value creation. Digital leaders must move beyond a fixation on operational processes and expand into customer-experience-driven benefits to boost the ROI from digital investments. Traditional ROI models work poorly for transformational digital investments. Traditional ROI models don’t effectively capture many of the benefits that transformative investments deliver. Yet these soft benefits are central to digital transformation activities. Managers dislike making investment decisions based on assumptions about soft benefits. Using traditional ROI calculations, you might not be able to persuade budget holders to invest in digital initiatives. As a result, you risk underinvesting in transformational projects. You must break down ROI calculations into smaller projects to get tangible results. ROI accuracy increases if you focus on specific customer benefits. Your ROI calculations should target specific business processes and user experiences at defined stages of the value chain. The report Building The Business Case For Your Digital Investments provides a framework for ROI calculations of transformative digital investments. It highlights examples of customer usage scenarios and how you can design ROI calculations to measure customer benefits at different stages of the value chain.